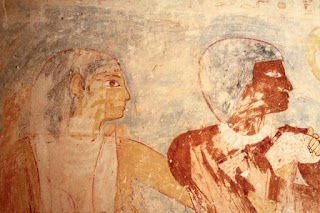 More images of the tomb paintings can be seen at National Geographic. his wife's pale skin tone (symbolizing the Moon). According to this October 18 press release, Egyptian archaeologists discovered a 4400-year-old tomb, south of the cemetery of the pyramid builders at Giza. It is the tomb of a high ranking priest Rudj-ka, who served as a purification priest for Khafre (2520-2494 BC). In a statement, Egyptian Minister of Culture Farouk Hosny, said the ancient Egyptian tomb was unearthed during routine excavations supervised by the Supreme Council of Antiquities (SCA) near the pyramid builder's necropolis. The recently discovered tomb belongs to a priest named Rudj-Ka (or Rwd-Ka), and is dated to the 5th Dynasty - between 2465 and 2323 BC. Dr. Zahi Hawass, Secretary General of the SCA, said that Rudj-Ka had several titles and would have been an important member of the ancient Egyptian court. The tomb’s walls are decorated with painted reliefs featuring Rudj-ka with his wife in front of an offering table filled with gifts of bread, goose and cattle. Daily life scenes depicting Rudj-ka fishing and boating are also shown. One role of the royal purifier was to ritually "cleanse" people who had been involved in bloodshed. This pertained to warriors after battle and to hunters after the kill. Blood was viewed as having the power to bring blessings or curses so people turned to the purification priests for spiritual protection. Priests like Rudj-Ka purified those who became contaminated through contact with blood.